Ground testing included weighing the BelugaXL at “pitch nine” configuration, raising the nose by almost 12 feet. Full-scale static-load structural tests have been performed on the junction points of the upper “bubble” and the lower fuselage, a rarity on a test airframe that is ultimately meant for flight. Airbus will perform around 600 hours of flight-test and certification flying on the new BelugaXL special heavy-lift aircraft, which unofficial sources suggest could fly as early as this week. Following a 10-month program, the design is expected to receive EASA airworthiness-approval as a derivative of the A330-300F freighter. In late June, Airbus (Outdoor Exhibits 13 and 25, Hall 1/Stand 1105) was validating flight-test instruments and preparing to paint a “smiling” color scheme on the first BelugaXL ahead of the first flight. The model, which is set to supplement the current Beluga ST fleet starting next year, has long been scheduled to make a maiden flight in the July to September time frame. Altogether, five BelugaXLs will replace the earlier aircraft, which entered service in 1995 to transport wings, single-aisle fuselage sections, and major sub-assemblies from Airbus's (and its suppliers') factories to the manufacturer's commercial-aircraft final-assembly lines in Toulouse (France), and Hamburg (Germany), and its A400M military-transport production center in Seville (Spain). The project is 44 months into a five-year development program that aims to increase the manufacturer's existing capacity by 30 percent by 2022. 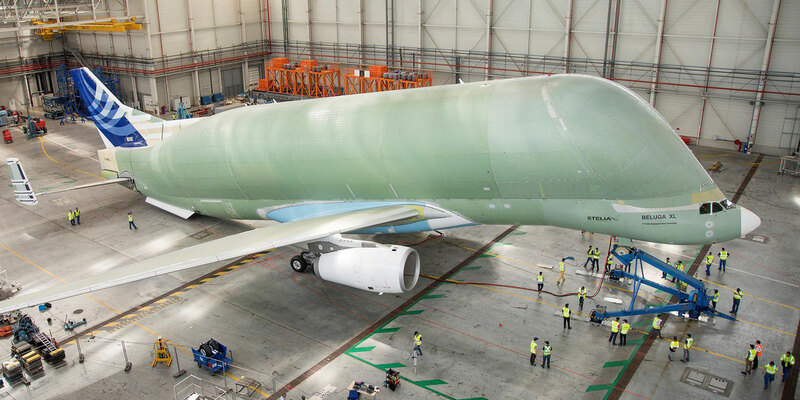 Properly identified as an A330-743L, the hybrid BelugaXL—which is developed from A330-200 and -300 platforms—is designed to lift six tonnes (5.95 tonnes) more payload than the current A300-600ST Beluga Super Transporter. It is six meters (about 20 feet) longer and one meter (40 inches) wider. To meet center-of-gravity considerations, the Rolls-Royce Trent 700-powered, fly-by-wire BelugaXL combines an A330-200 forward section with the aft portion from the longer -300 model and includes the A330-200F's stronger cargo floor and primary structure. The aircraft features a new much-larger cargo bay, while the rear fuselage and tail section have been redeveloped. The second of five planned aircraft is scheduled to inaugurate BelugaXL operations in about 12 months, ahead of the third-built example later in 2019. Remaining examples will follow yearly, before the older BelugaSTs are retired during 2022-25. In June, following loads-calibration ground-testing (and in conjunction with respective French and German government aerospace-research centers Onera and DLR), Airbus completed airframe-vibration trials with the initial airframe. The company says that the BelugaXL was "put on pneumatic suspension and special 80-kg 'shakers' were installed to make it move." Onera/DLR engineers placed the shakers at 30 locations for tests lasting two to three hours, while 600 internal and external sensors monitored the structure. The two research centers have performed such tests jointly on 10 previous Airbus prototypes, notably the A320neo, A350-900, and A380. The experimental test data is useful in updating the BelugaXL mathematical structural model and particularly valuable in helping to predict vibration amplitudes and to demonstrate freedom from flutter risks throughout the flight envelope, according to DLR. "The tests were conducted in two configurations: with an empty fuselage and loaded with a heavy, "tuneable" payload, said DLR, adding, "[Some] 7,000 meters of cable and 300 meters of optical fibers were installed on the fuselage, empennage, engines, and wings." Airbus attributes its success in meeting its schedule to "early analysis of the requirements, and excellent multi-disciplinary collaboration [among] the design office, laboratories, [and] tests and program teams." Heavy ground testing started with weighing the BelugaXL "at 'pitch zero' and then at 'pitch nine,'" said Airbus. The latter exercise required elevating the nose (which incorporates a lowered cockpit to permit straight-in forward cargo loading) by 3.5 meters (almost 12 feet) to establish the empty-weight center of gravity. "Next, [the team] performed the standard loads and horizontal-tailplane tests, followed by separate evaluations involving the dorsal fin and vertical tailplane," according to the manufacturer. Airbus acknowledges that ground-testing is more usually conducted on a static-test specimen. “It is unusual to perform tests like load calibration using the generalized finite-element method of analysis on an aircraft which will fly, a dedicated 'clean' aircraft without any systems inside,” said BelugaXL aircraft-configuration leader Arnaud Puyo. Specimen full-scale static-load tests have been performed on structural joints between the BelugaXL's new "upper bubble" cargo bay and the A330 lower fuselage. “Data will be used to clear the aircraft for flight and to attain type certification,” said program head Bertrand George. The BelugaXL is intended to ship loads of up to 52 tonnes (51 tons) over 2,200 nm (4,075 km). Compared with the smaller BelugaST, the greater volume of the new machine can accommodate a pair of A350-1000 wings rather than a single example.